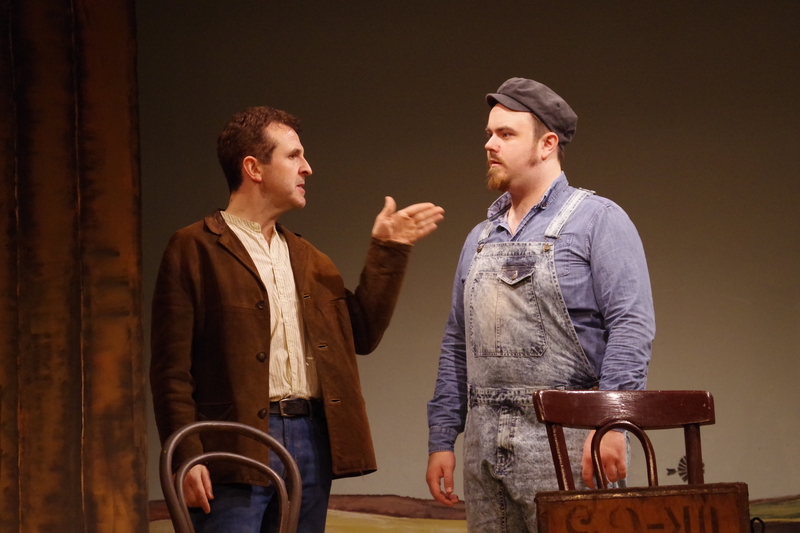 Paul Baker and Matthew Sims in ‘Of Mice And Men’. John Steinbeck’s acclaimed 1937 play has long been regarded as an American literary classic and, having made regular appearances on the English stage, is today a set text in the GCSE and ‘A’ level curricula. Mike Savill, having waited years for the performing rights to become available, finally succeeded in bringing it to the BLT stage in June. The play paints a vivid picture of life in the great American depression, as itinerant workers roamed the wide-open spaces of the West in a desperate search for work. Its themes of friendship, loneliness and hopelessness are movingly illustrated through the arrival at an isolated farm of an oddly-assorted pair of such men: Lennie has enormous strength, but the mind of a child, which combination frequently causes trouble from which George, his mentor and staunch protector, has to extricate them. This occasion is no exception and confrontation with the boss’s son and his lonely wife lead ultimately to tragedy. The design, by Jan Greenhough and the director, brilliantly evoked the time, place and atmosphere which are so crucial to the action. The timbered farm bunkhouse served flexibly for interior scenes but also revealed a great expanse of sky over a featureless plain, its colours irresistibly conveying the heat and desolation of the location. Emma Christmas’s lighting contributed significantly to the effect, as did the farmhands’ costuming by Emma Kerby-Evans and Karen O’Neill, totally appropriate to character and period. This beautifully plotted and scripted play is driven primarily by the two central characters. As George, Paul Baker delivered a finely detailed characterisation in which both its hard edge and its softer approach to Lennie were shown with restraint and truth. His desperation at his own situation and his cathartic final scenes were particularly affecting. As Lennie, Matthew Sims had the physicality demanded by the part and convincingly portrayed a limited mental capacity without any trace of exaggeration or stereotype. He handled abrupt character changes from charming simplicity to obstinacy, frustration, disappointment and eager anticipation with naturalness and skill. Fine though these two were, the really outstanding feature of this production was the strength of performances from every other member of the cast. Steinbeck’s authentic characters and dialogue were faithfully and creatively presented, both individually and as an ensemble. Michael Baker gave a multi-faceted portrayal of Candy, the aging farmhand who mistakenly placed his trust in George to provide a jointly prosperous future. In particular, his distress at the shooting of his dog was genuinely emotional. Curley, the boss’s aggressive son, was played with all the force and vigour called for by Gavin Dyer. Holly Connell-Wallace gave Curley’s wife – the only name by which she is known – the sultry quality which was the catalyst for trouble among the men and her participation in a totally convincing and brutal fight sequence was remarkable. Stuart Lakin gave Slim the quiet, calm and wise presence which should have been listened to but wasn’t and Mark Dempsey convinced as the gun-toting hard man of the group. Joe Dominic made the most of the limited opportunity provided by Whit and the director made a brief but highly authoritative impact as the Boss. Last, but by no means least, indeed one of the most natural characterisations, was Sheyi Cole’s as the nervous and overwrought black farmhand Crooks. The company delivered a totally secure ensemble performance for which, of course, great credit must go to director Mike Savill. The pace of the performance was expertly varied and controlled, particularly the relatively slow first half, deliberately emphasising the sense of time and place, and the later acceleration building the tension towards the shocking climax. All in all, a brilliant piece of writing developed by a very strong cast to provide a truly memorable theatrical experience.